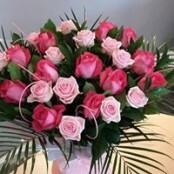 Welcome to Dolce Vita Florist's website. 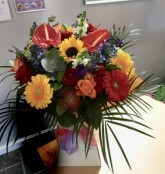 We are an award winning florist of over 13 years and have won several awards during that time. We have an experienced, enthusiastic and talented team ready to create wonderful floral creations for you and your friends. We have fresh flowers every day and guarantee unique beautifully designed creations that have the Wow factor and are long lasting. Balloons for all occasions, gifts, vouchers, chocolates and fruit baskets available too. 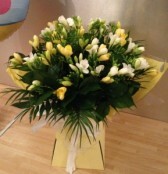 At Dolce Vita Flowers we can provide same day flower delivery if you order before 1pm. Here at Dolce Vita Flowers we are constantly developing our ideas and you can follow our progress on our Facebook page where we udate daily and have regular offers and competitions. Please call 01467 622300 to talk to us and we will be happy to take your order and discuss your requirements or use our online ordering system above if it is more convenient. Check out our reviews page for up to the minute independent reviews.